Parking Directions to The Bishop Apartments -You can use the Palisades office Building address 5901 Peachtree Dunwoody Road Sandy Springs, GA 30328 -Drive into the entrance of the Palisades Office Building and make an immediate left passing the west parking deck -You will park in front of Building D and the Bishop Courtyard- Follow the balloons to the leasing office. *Advance registrations will end at noon the day prior to the event. 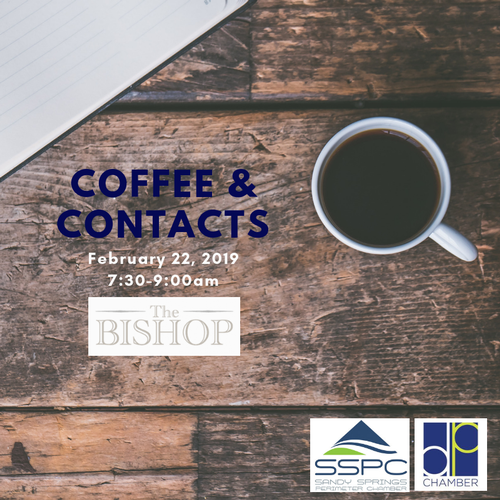 Join the Dunwoody Perimeter Chamber and Sandy Springs Perimeter Chamber and the for this great opportunity to grow your business on February 22 from 7:30 AM - 9:00 AM at The Bishop. Coffee & Contacts is a joint event between the two Chambers in which attendees network and learn more about fellow attendees and how their businesses may best complement each other. During the event, attendees use their one-minute elevator speeches to describe their businesses to everyone in attendance. After the event, all attendees will receive an Excel listing of all attendees to use for network strengthening purposes.